COMPOSITION : Each film coated tablet contains Bicalutamide USP 50mg. 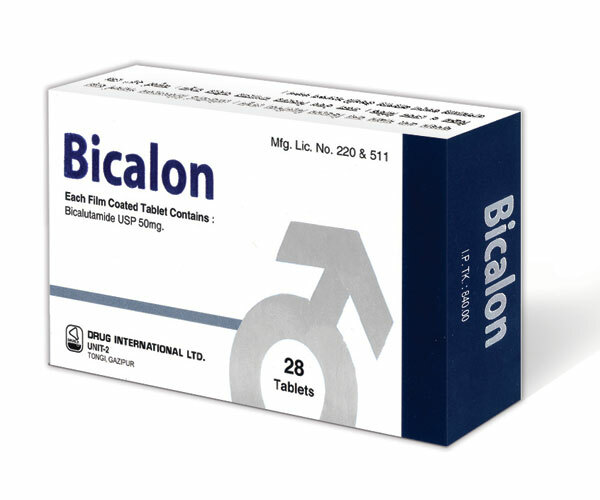 INDICATIONS : It is indicated for use in combination therapy with a luteinizing hormone-releasing hormone (LHRH) analog for the treatment of Stage D2 metastatic carcinoma of the prostate. DOSAGE AND ADMINISTRATION : The recommended dose for Bicalutamide therapy in combination with an LHRH analog is one 50 mg tablet once daily (morning or evening), with or without food. It is recommended that Bicalutamide should be taken at the same time each day.Treatment with Bicalutamide should be started at the same time as treatment with an LHRH analog. Dosage Adjustment in Renal Impairment : No dosage adjustment is necessary for patients with renal impairment. Dosage Adjustment in Hepatic Impairment : No dosage adjustment is necessary for patients with mild to moderate hepatic impairment.In patients with severe liver impairment, although there was a 76% increase in the half-life (5.9 and 10.4 days for normal and impaired patients, respectively) of the active enantiomer of Bicalutamide no dosage adjustment is necessary. Or, as directed by the registered physicians. Use in pregnancy and lactation : There are no adequate and well controlled studied in pregnant and lactating women. It may cause fetal harm when administered to a pregnant woman. If this drug is used during pregnancy, or if the patient becomes pregnant while taking this drug, the patient should be apprised of the potential hazard to a fetus. Packing : Each box contains 28 tablets in Alu-Alu blister pack.